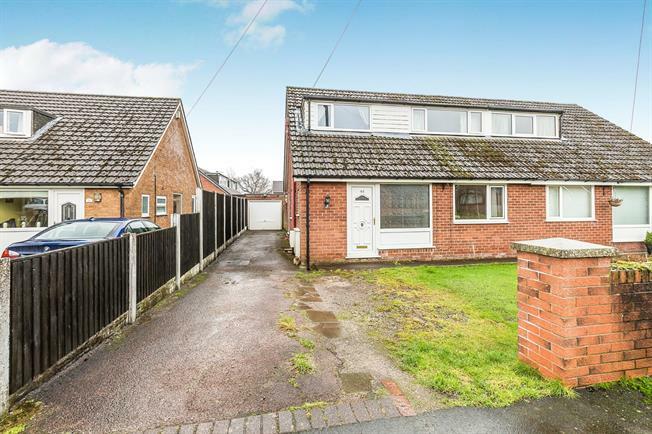 3 Bedroom Semi Detached House For Sale in Preston for Offers Over £190,000. This delightful three/four bedroom semi detached family home has been mindfully designed with modern living in mind and provides a large amount of flexibility. The exceptionally well proportioned accommodation briefly comprises of an imposing entrance hallway, a light and airy cosy living benefitting from sliding patio doors overlooking the garden and a beautiful electric fire with marble surround. The wonderful breakfast kitchen provides a host of integrated appliances and a breakfast bar, perfect for entertaining the family. The ground floor also benefits from a luxury three piece bathroom suite and a further reception room/bedroom. Upstairs, you will find three generously proportioned bedrooms, the master bedroom providing a shower cubicle. Externally, the property provides off road parking, a detached single garage and landscaped gardens front and rear. View to appreciate. UPVC double glazed entrance door. Double glazed uPVC window facing the front. Radiator, laminate flooring. Staircase leading to the first floor. Spotlights to the ceiling. UPVC sliding double glazed door, opening onto the garden. Radiator and coal effect gas fire with feature surround, laminate flooring. UPVC double glazed door. Two double glazed uPVC windows facing the rear and side. Feature full length radiator, laminate flooring, tiled splashbacks. Complementary work surfaces, fitted wall and base units, breakfast bar, stainless steel one and a half bowl sink with drainer, integrated electric oven/grill, four ring gas hob, stainless steel extractor fan, integrated dishwasher, integrated washing machine, integrated fridge/freezer. Double glazed uPVC window facing the front. Radiator, carpeted flooring. Two television aerials. Two double glazed uPVC windows facing the side. Heated towel rail, tiled flooring, tiled walls with mosaic border. Low level WC, 'Sanitan' spa bath with fitted speakers and a fitted flat screen television on the wall, pedestal sink, extractor fan. Spotlights, two high gloss inset storage cupboards. Carpeted flooring. Loft access point. Two double glazed uPVC windows facing the front and rear. Radiator, carpeted flooring. Storage into the eaves at the front and the back. Fully tiled shower cubicle with shower attachment and extractor fan. TV and telephone point. Double glazed uPVC window facing the rear. Radiator, carpeted flooring. TV and telephone point. Double glazed uPVC window facing the front. Radiator, carpeted flooring. TV and telephone point.